After a long and full life, Esma Elizabeth Cronin, 101, passed away peacefully Monday, Aug. 20, 2018, at Silver Maples of Chelsea Retirement Community. Her daughter, Mary, and son-in-law, John, were by her side. Esma was born Dec. 16, 1916, in Pine Village, Indiana, to Dr. Duffield Dufferin MacGillivray and Mary (Jones) MacGillivray. She met her husband, Charles (Chuck) Cronin, in California, and they were married in 1946; they were divorced in 1966. She is survived by her daughter, Mary Cronin; son-in-law, John Johnson of Ann Arbor, Michigan; and a stepdaughter, Charlen Bladdy of Glenview, Illinois. Esma was preceded in death by her parents and a brother, James Duffield MacGillivray. Esma graduated from Pine Village High School in 1934, where she played center on the girls’ basketball team. 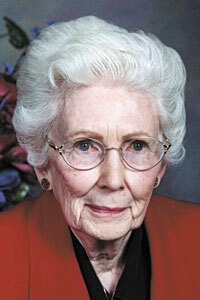 She also graduated from Indiana University in 1938 with a bachelor’s degree in history and a minor in math. She was a member of Chi Omega sorority and captain of the women’s rifle team. After graduating from Indiana, Esma spent a year at Purdue University, earning a teaching certificate in physical education and math, and then taught high school for five years in Redkey and Rushville, Indiana. Vowing to never teach again, Esma joined the war effort in 1944 and served as a weather observer for the U.S. Weather Service in Pasa Robles, California. Chuck was a baseball pitcher and team manager, and they spent the first years of their marriage living in Sacramento, California; Wenatchee, Washington; Newcastle, Pennsylvania; and Raleigh, North Carolina, where he played for and managed minor league baseball teams. Later, the couple settled in Tiffin, to be close to Chuck’s daughter by a previous marriage and where their daughter, Mary, was born in 1948. Despite her earlier vow, Esma returned to teaching in 1952 and taught American and world history, algebra, civics, health, and physical education in Tiffin public schools. She also served as cheerleading and pep squad coach for many years. Esma continued taking graduate-level courses in history at Purdue University over the years, but was just shy of attaining a master’s degree. Esma retired in 1978 after 31 years of teaching. Many of her former students still remember her as their favorite teacher. Esma enjoyed her retirement by traveling around the country and visiting Europe many times. She remained active by serving as a docent at Seneca County Historical Museum in Tiffin and volunteering at Betty Jane Center’s thrift shop. She was a long-time member of Trinity United Church of Christ council and Mother’s Circle, Order of the Eastern Star, A.A.U.W., Tiffin Women’s Club, Seneca County Retired Teachers and Pan Hellenic Council. Esma also was an accomplished seamstress, knitter, bridge player, cook, generous friend, prolific reader, gardener and wonderful mother (and mother-in-law, John adds). She was an inspiration to all who knew her. In 2007, Esma moved to Michigan to be near her daughter and found a whole new life and group of friends at Silver Maples in Chelsea, Michigan. She enjoyed their coffee hours, happy hours and various programs they offered. She served as chairperson of Silver Maples’ resident food committee, served on their residents’ council, played on their Wii (multi-player computer game) bowling team and belonged to two bridge-playing card groups. She also helped start a scholarship fund for the young people who work at Silver Maples. She continued to garden with a small balcony flower garden and by also advising the Silver Maples grounds crew on new and old flower plantings. Until macular degeneration affected Esma’s eyesight, she was an avid reader and she continued to knit dozens of “new baby” caps for hospital maternity wards. She also loved following “her Detroit Tigers.” Recently, she delighted in listening to audio books on an Amazon Echo and devoured at least one a week. Mary and John want to thank all the staff of Silver Maples, Arbor Hospice and especially Dr. Rebecca Patrias for taking such excellent, compassionate care of Esma. Cremation has taken place. She will be interred next to her parents and grandparents in Pine Village, Indiana. A celebration of Esma’s life will begin at 3 p.m. Sept. 8, 2018, at the Maples Room of Silver Maples, 100 Silver Maples Drive, Chelsea, MI 48118. In lieu of flowers, donations can be made to Silver Maples Scholarship Fund or Faith in Action, Chelsea, Michigan.